Stone floors are great for one big reason: they are durable. In fact, most of the people that you will come across who have invested in stone flooring in Scottsdale will always tell you about how they love the durability of their floors. These are floors that will actually stand the test of time. If you have been keen on some of the museums you have visited before, you will notice that most of the floors that have been used many years back, and are still available today, were made of stone. Therefore, it is certainly a good idea for you to consider installing stone floors in your home. In as much as stone floors are durable, there are other factors that you also need to take into consideration. Most of the time, people end up with Scottsdale stone flooring that is durable but does not look good at all. It is actually such a sad state of affairs if you walk into such a house. The stones will, indeed, last so long, but their appearance might fade away over time. You can avoid this by getting the proper care for your floor. You should have the floor dusted and mopped regularly so that the stones can maintain their shine. At the entrance, ensure you have walk-off mats so that people do not drag debris on the floor. Remember, just like any other surface, the stone floors are susceptible to scratches, which leave noticeable marks on the floor. One of the other things that you need to pay attention to when you have Scottsdale stone flooring is the need for floor polishing. Such natural floor alternatives are usually great, but you have to invest in regular polishing. If you can do that, you can be sure your floor will last for a long time, and everyone will always wonder whether you just had new floorings installed. 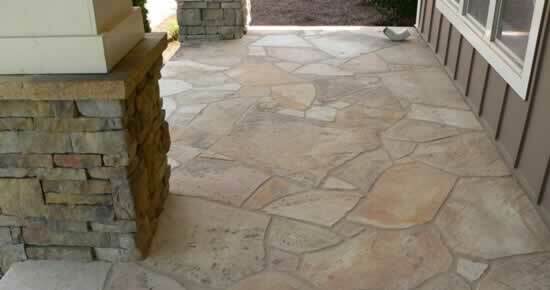 How can I effectively deal with staining on stone flooring in Scottsdale? The problem of stains is a challenge not just for stone flooring in Scottsdale, but it is a challenge that cuts across many other types of floors. Basically, stains are bound to happen, and that is a sure guarantee. You could have stains from hosting people in the house, your pets or even by accident. The secret is how you react to the stains. Practically, always make sure you wipe away the stains as soon as possible. The longer they stay on the floor, the harder it will be to effectively get rid of them. What causes cracks in my Scottsdale stone flooring? Cracks are common with most of the Scottsdale stone flooring options. The reason for this is because of uneven expansion and contraction. What you need to do is learn how to avoid the chances of cracks on your floors. During the hot seasons, for example, it would be unwise to use really cold water on the floor when you are cleaning. This causes undue pressure on the floor and cracks will appear. Do I really need to get an expert for stone flooring in Scottsdale? The best answer to this question is often based on the kind of outcome that you have in mind. For Scottsdale stone floors, an ideal option would be to make sure that you get an expert to handle the installation. They are experienced, and given their penchant for quality results over time, this would be an ideal way to make sure that you have professionally installed stone floors, which will also last for a very long time.